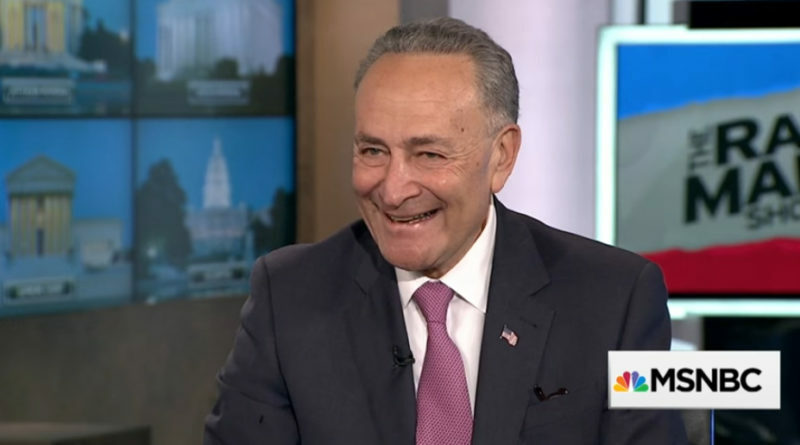 We have Chuck Schumer to thank for this latest attack! A diversity visa! Really? Should Schumer be held legally responsible for this horrible criminal act? Terrorism is a serious threat, it’s not a social experiment! Appeasement and a blasé attitude by the Democrats will get us all killed! It’s time for all our elected officials to look out only for the American people. 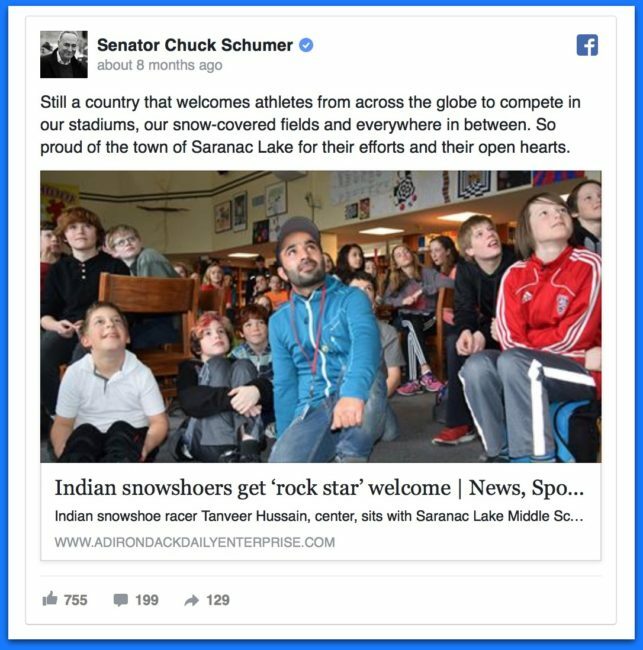 The media CHEERED when Democrat Senator Chuck Schumer (D-NY) helped a 24-yr old Muslim man enter the U.S. after he was denied entry…The media was strangely SILENT, however, after he molested a 12-yr-old upstate NY girl while she was with her family at an event celebrating the Muslim athlete. Yesterday, it was discovered that the Islamic extremist who killed 9 people and injured dozens of others, when he rammed his truck into them on a busy bike path in New York City, entered our country on a “Diversity visa” that was the brainchild of none other than the Democrat Senator from NY, Chuck (I always put diversity before our nation’s security) Schumer… 100%FedUp. An Indian athlete who overcame a visa denial with the help of U.S. lawmakers and a local mayor to attend the World Snowshoe Championship in New York has been arrested on charges of the abuse of a minor. It was a long journey for Indian snowshoe champion Hussain and his coach to the World Snowshoe Championships in Saranac Lake, New York last weekend. 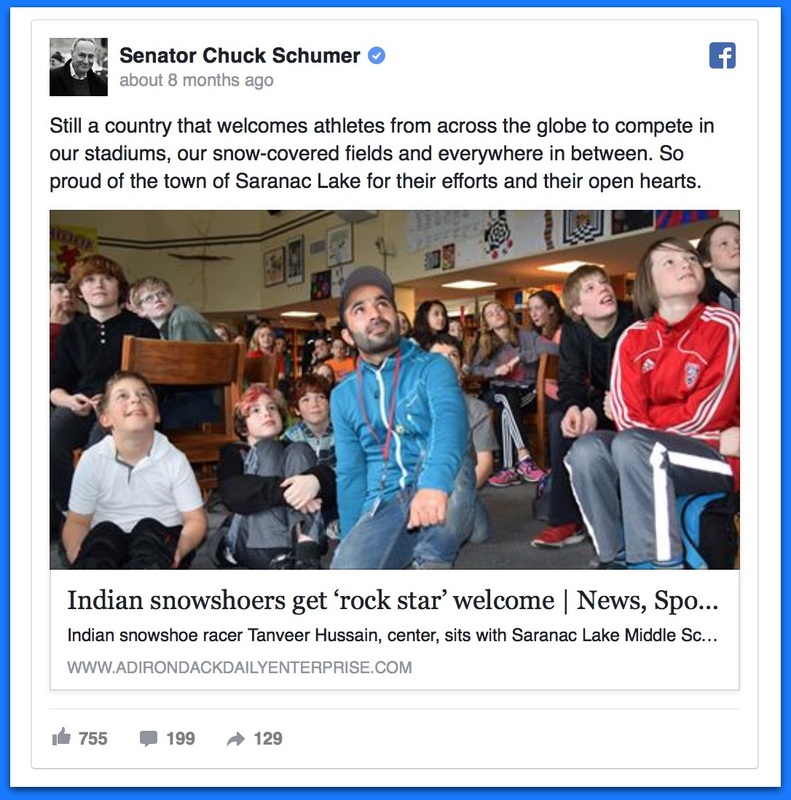 The pair were initially denied visas to travel to the U.S. in the chaotic days following the Trump administration’s travel ban, but with the help of Saranac’s mayor and — according to Mir — the office of Democratic Sen. Chuck Schemer, the American Embassy in New Delhi reversed their decision Feb. 17 and allowed them to travel to the competition. Hussain hails from the Indian side of the disputed Himalayan region of Kashmir, which is predominantly Muslim. Although India is not one of the seven countries that were part of the initial travel ban, Hussain and Khan had alleged they were victims of it when their first attempt at procuring visas to travel to the United States was turned down in late January, the first business day after Trump’s travel ban was put in place. Tanveer Hussain was indicted in August, 2017, by an Essex County grand jury for allegedly having inappropriate contact with a 12-year-old Saranac Lake girl earlier this year. The grand jury returned the indictment charging Tanveer Hussain with one count of first-degree sexual abuse and two counts of endangering the welfare of a child, a report in the Adirondack Daily Enterprise quoted a press release from Essex County District Attorney Kristy Sprague as saying. The reckless and irresponsible acts of Democrat legislators like Senator Chuck Schumer, perfectly illustrates why Trump was right about demanding that we put additional vetting measures in place for immigrants. Hussain and team manager Abid Khan arrived Feb. 23 in the bucolic Adirondacks town, which had been following their visa ordeal and extended them a hero’s welcome. Locals offered congratulations and free lodgings at an inn that in the snow looked like a “fairy tale scene from a movie,” Khan said in a Facebook post. The “fairy tale” was shattered Wednesday, when Hussain, 24, was arrested and charged with felony sexual abuse and child welfare endangerment, police said. The parents of the 12-year-old girl allegedly involved said the incident happened Monday, after the end of the three-day snowshoe competition, and reported it to local authorities. Chief Charles A. Potthast Jr. of the Saranac Lake Village police force said the girl was playing pool Monday afternoon with other young people at the inn where Hussain was staying. “There was a moment when the two were alone, and that’s when the incident occurred,” Potthast said. The girl told police there was a “passionate kiss” and that Hussain touched her in an intimate area on top of her clothing. Hussain remains jailed on $10,000 bond. Khan said the athlete told him he had done nothing wrong. The athlete’s coach said he is innocent.